The latest edition of the monthly Money Talk newsletter is available and already being read by hundreds of subscribers. 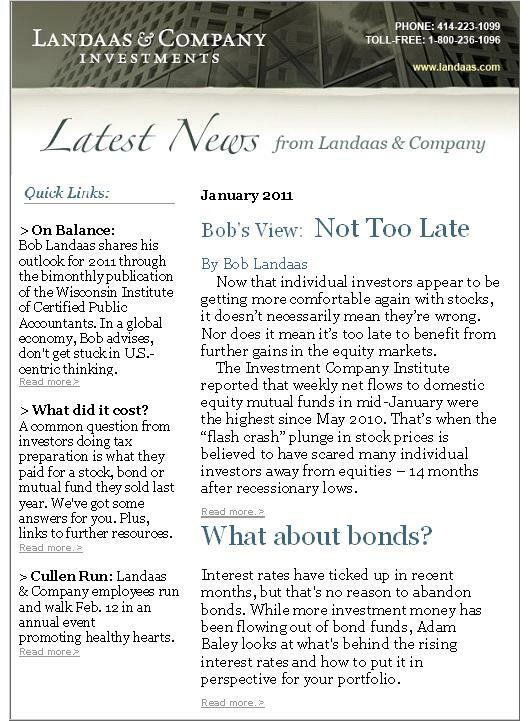 Included in this month’s issue are Bob Landaas’s take on whether it’s too late for investors to benefit from the stock market, Adam Baley’s update on how interest rates affect how bonds figure into portfolio considerations, and Brian Kilb’s outlook on possible impacts from proposals to fix the federal deficit. To get the monthly newsletter sent to your inbox, fill in the enrollment form on our website and confirm the follow-up message that it generates. To subscribe now, please click here.